When the weekend rolls around, I’m excited for several things. Sleeping late? Yep. Seeing friends? Of course. Brunch? If I have a weekend without brunch on at least one of the days, I feel sad and surly. I know chefs like Anthony Bourdain hate brunch but it’s one of my favorite weekend indulgences and I’m not about to quit it. These are a few of my favorite brunches in NYC. Pies-n-Thighs (Williamsburg). My favorite is the chicken biscuit, it’s all great. Just plan to nap afterward. You’ll be full and sleepy. Sweet Chick (Williamsburg). I always intend to have dessert. Not once have I managed to save room. 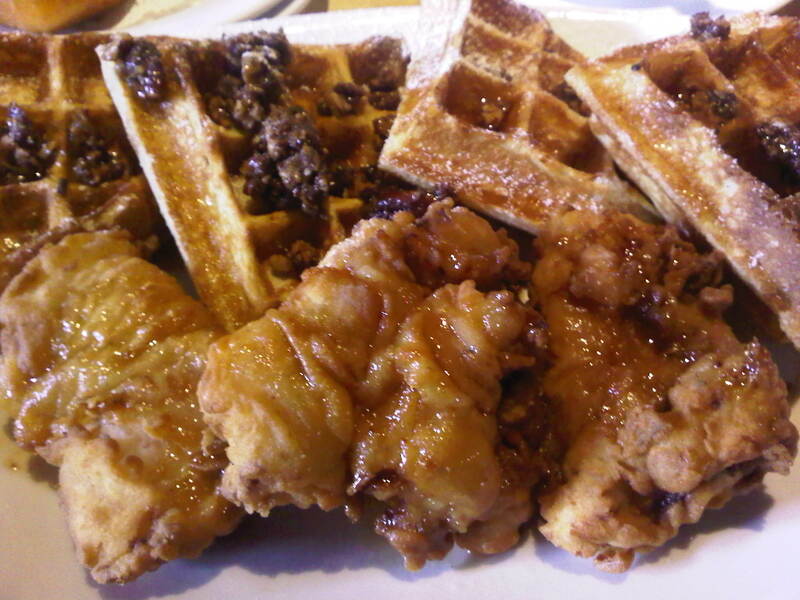 Get the chicken & waffles. Spring Natural Kitchen (Upper West Side). My favorite little boy, his mom and I like to go to this spot. Can’t go wrong with any of the pancake or French toast options. I also have some brunches I’m eager to try. Northern Spy Food Company (East Village). I’ve never had pork sticky rolls. It’s time. Preserve24 (East Village). Some people are sick of salted caramel but I’m not one of them. Bring on these pancakes! Sarabeth’s (several locations). Not sure how I haven’t made it to this brunch staple. Tink’s (East Village). The struggle would be to choose just one entree. What’s your favorite brunch spot where you live? This entry was posted in Food, NYC and tagged brooklyn, brunch, food, nyc, restaurants, williamsburg on December 21, 2013 by onechicklette. Blue Moon Fish Company, Fort Lauderdale, FL. Literally…the best brunch I’ve EVER had. EVER.